Toronto Fire crews battled two large fires Saturday morning — one at a North York highrise and the other at two Christie Pits homes. The North York fire required TTC buses to shelter residents (photo from the second blaze):. 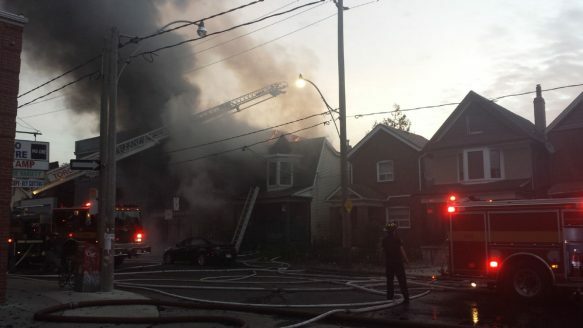 Toronto Fire was called to an apartment at Wilson Ave. and Ridge Rd., west of Keele St., at 6:30 a.m. Saturday. That fire was upgraded to a one-alarm and the building was evacuated. TTC buses were called in to shelter the residents and police closed Wilson Ave. in both directions at Ridge Rd. while crews fought the fire. The fire was knocked down and residents have been allowed to return. Half an hour later, Toronto Fire was called to Christie St. near Dupont St. after reports of two houses, next to each other, on fire.